Recipe: Surely it’s not that time of year in the Kitchen Garden already? Yes … afraid it is. Time to get ready in our Kitchen Garden for the winter crops. Still overflowing with ripe summer produce, but time to think of what to plant to give us food to last us through the dark, dank months of winter. Alderton climbing peas, over six foot high! The Alderton climbing peas have already finished – they were so sweet. Out came the main broad bean plants – we’ve frozen loads of brilliant apple-green small broad beans (well, Erik did, he’s really good at that – he even peels the skins off). I dug in some well-rotted compost and new multi-purpose soil, watered everything well and now I’m using it as a temporary seed bed to grow more vegetables and winter lettuce and chicory to give us a good selection for the coming months. 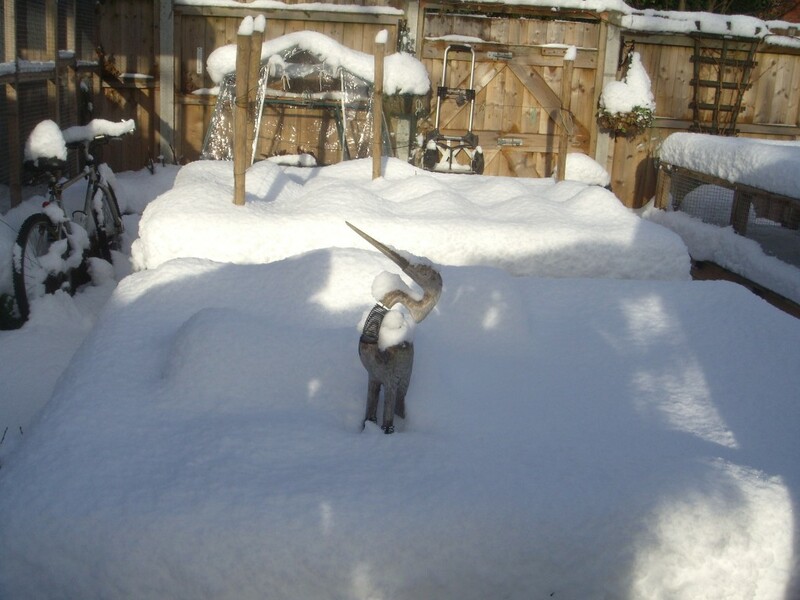 I’ve sown two different types of Italian style Chicory, some Redbor Kale, more Leeks and Carrots, some Romensco Broccoli, Winter Sorrel (so lemony), Mizuna and various hardy Lettuces that will need a cloche over them to keep nice and warm (especially if we had a winter like the last one, see below). steamed, roasted, pureed – whatever), Runner Beans still flowering and growing and loads already frozen (Erik again), more of the brilliant Silver White Chard (Gratin with Garlic, Parmesan and Cream, so delicious but deadly), Celeriac, Red Cabbage, White Cabbage and Cavolo Nero (kale), so we shouldn’t go hungry! 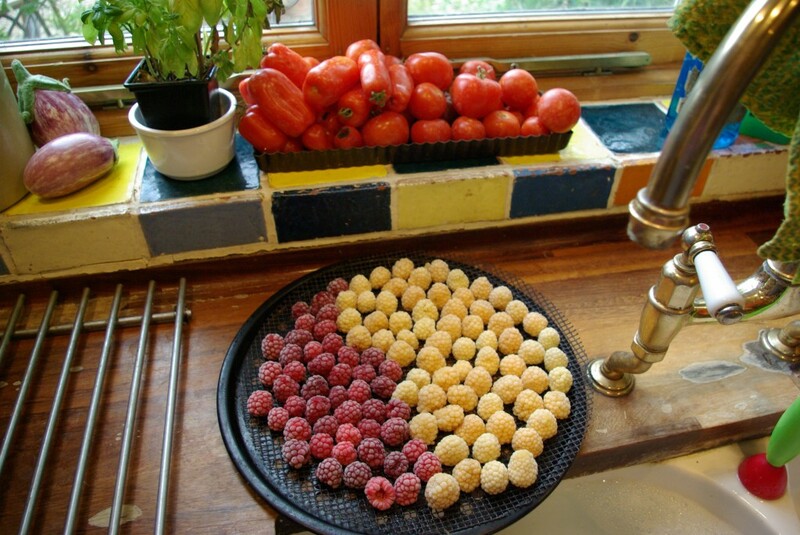 Ripe, sweet raspberries, and early Autumn Sungold yellow raspberries, all ready on the tray to freeze. Sorbets, icecreams, tarts are all calling out to be made. Oh, and I forgot – Tomatoes, masses of them, all sizes, all colours including stripey, and all they need now is sun. Lots of it please to ripen up. They will be eaten fresh, used in my summer favourite, Gazpacho, liquidised into sauces (including our own Tomato Sauce – see recipe below), dried in the AGA and bottled in olive oil, and of course I make a big batch of my favourite Tomato Soup (recipe also below). My Lovage is taking over a corner of the garden, but I’m looking forward to making a big batch of creamy Lovage Soup for now and for the freezer. Will find the recipe and type it up in a week or so. It has a flavour more delicate than celery, a slightly more sophisticated taste and very ‘moorish’ when mixed with a good chicken stock and some butter-sweated finely chopped shallots and a big swirl of cream. It never occurred to me that writing so much about food would make me feel so hungry – would give me an appetite. But just thinking about all the fruit and vegetables we have grown this year in our Kitchen Garden makes me feel so ‘in tune’ with the earth and its bounty. Maybe its because I’m an earth sign, Virgo? Heat olive oil in a pan over medium heat. Add the pancetta/bacon and onion and cook for approx. 3 minutes until the onion is translucent. Add the garlic for 2 minutes to soften gently. Add the tomato puree, and stir well for a minute, coating all the ingredients. Break up the tinned tomatoes with a spoon and add to the pan. Add a good pinch of sugar. Stir well. Simmer gently for 40 minutes until all the ingredients have merged into a thick, rich sauce. Keep tasting and season with salt and pepper to taste. Either eat straight away with pasta, or cover and store in fridge when cooled, or freeze. Omit the pancetta/bacon if you want a pure, vegetarian Tomato Sauce. Or add some chilli (fresh or dried) to give the sauce a ‘kick’ of heat. The addition of fresh basil leaves sprinkled on top of the sauce when eaten give the traditional Italian flavour. Melt butter, add chopped bacon, onion and carrot and brown lightly. Mix in flour and cook to a sandy texture over gentle heat. Remove from heat. Add tomato puree – return to heat. Gradually add hot chicken stock, stirring until it comes up to the boil. Add whole skinned tomatoes, bouquet garni and seasoning. Simmer gently for at least one hour. Take off heat and cool. Remove bouquet garni. Liquidise – sieve to remove seeds if necessary. Return to pan, check seasoning and reheat. To skin tomatoes – Slash across the top of tomato – put in bowl and pour boiling water completely over the top of tomatoes – after 10 minutes strain and plunge into ice-cold water and the skins should slide off. Some people prefer to de-seed the tomatoes with a teaspoon, to save sieving afterwards. I prefer to keep the seeds in the soup mix and sieve them out after cooking. I just like to keep as much flavour in as possible. Cool the soup down, pack into cartons, label and freeze. It freezes very well. When needed, defrost either in carton or put in pan with tablespoon of water, simmer gently until defrosted, bring to the boil and serve. The recipe works well if you want to double or treble the amounts to freeze a lot of soup when tomatoes are in season.